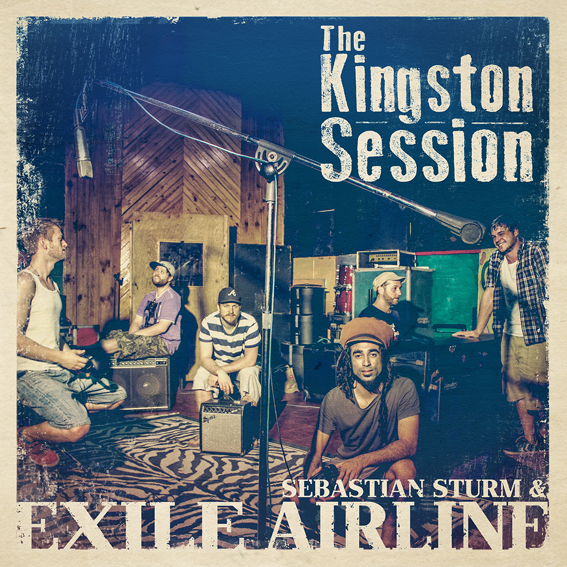 On his brand new album The Kingston Session German singer Sebastian Sturm, together with his band Exile Airline, headed to the Jamaican capital and the legendary Harry J studio for its recording sessions. They locked themselves in the studio for two days and came out with an inspired nine track album recorded live in the studio using only the bare essentials – guitar, bass, drums and keys. The set collects easy-going, organic and stripped-down versions of mostly previously released material, and the only new cut is a version of Freddie McKay’s Free Man. Sebastian Sturm has a raspy voice and a dramatic, almost theatrical, style with a bit of vibrato. The raspiness is a bit similar to Bob Marley and the drama is reminiscent to how Groundation’s lead vocalist Professor sounds. It works well with the jazzy arrangements and the jam-oriented grooves that the band present on several tracks, especially on the almost nine minute long Free Man. This is Sebastian Sturm’s fifth album and it was successfully financed via crowdfunding, and I have a feeling his fans and investors will love what they hear.